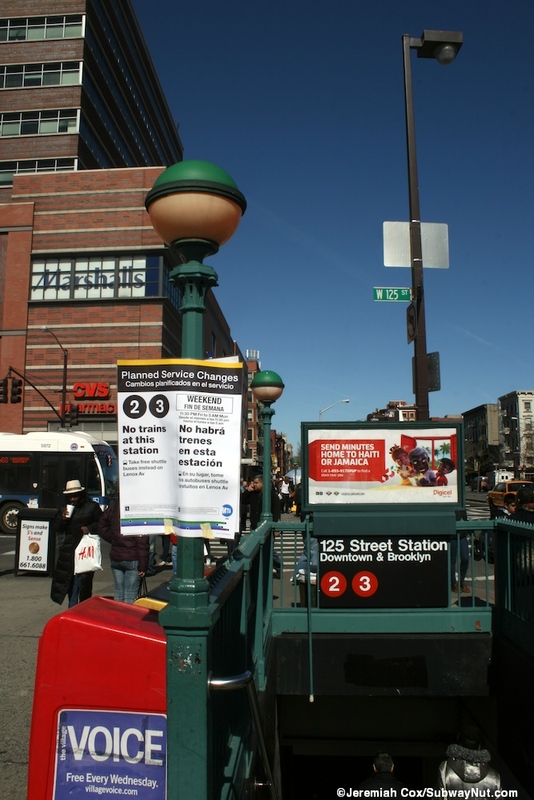 125th Street is a simple Lenox Avenue line station. 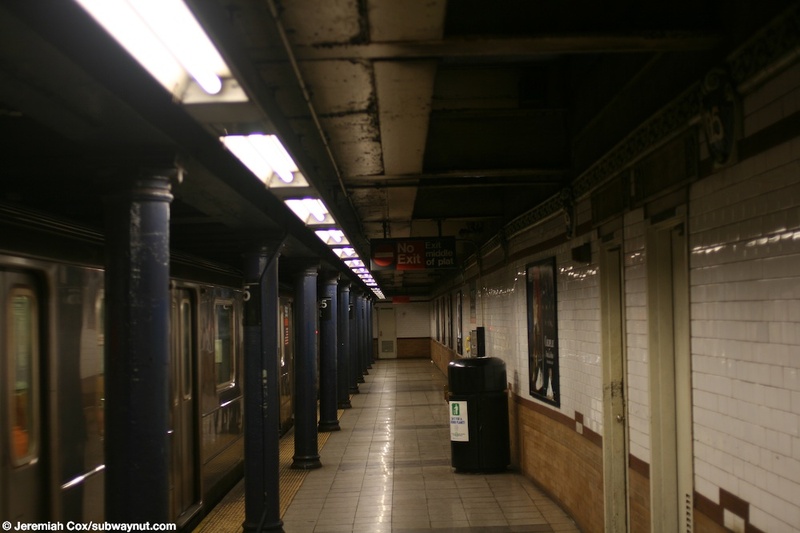 The station has two side platforms and was recently renovated in about 1996. 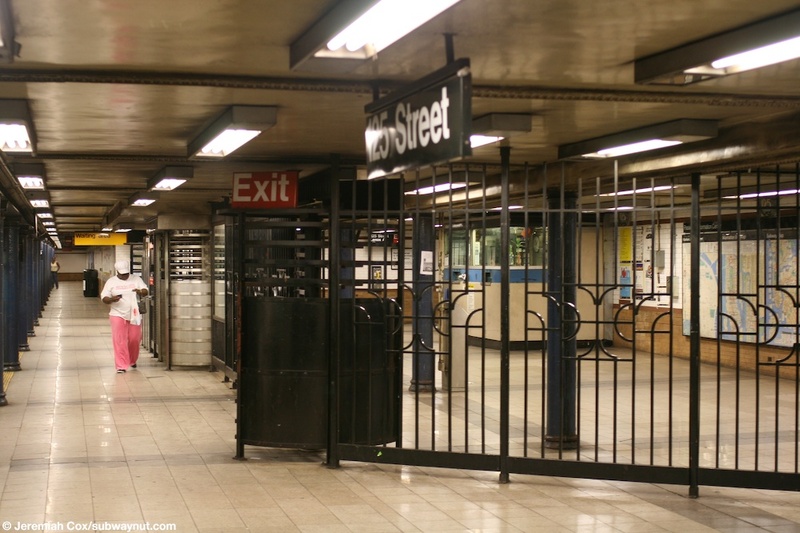 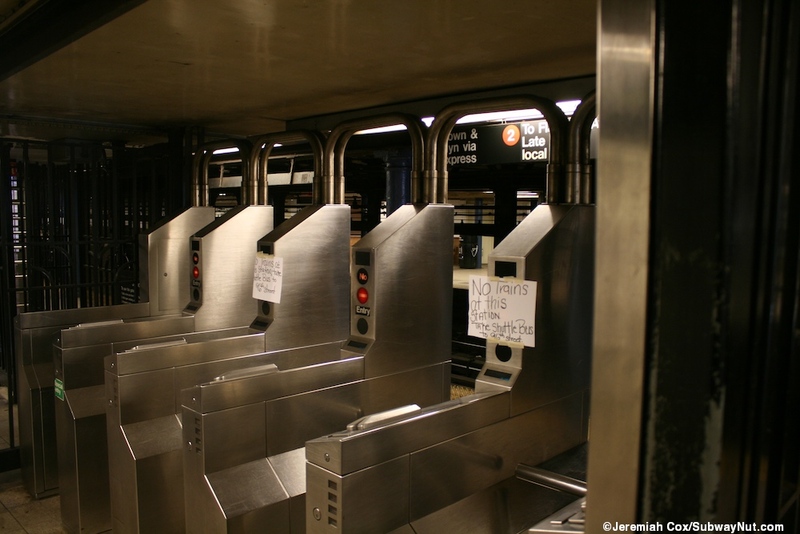 Fare control is along the side platforms in the middle and each area has the customary two street stairs one up to either corner of 125 Street and Lenox Avenue with no free crossover or under. 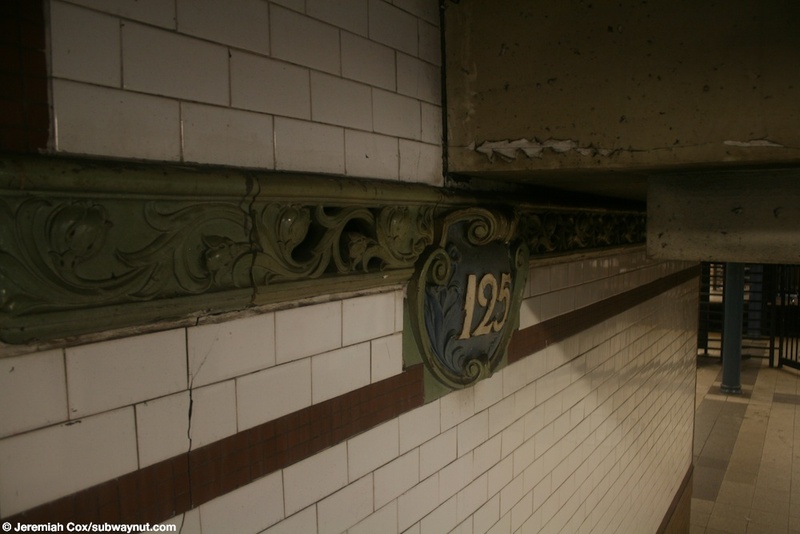 The station still has orginal looking name tablets and terra cotta cartouches in the trim. 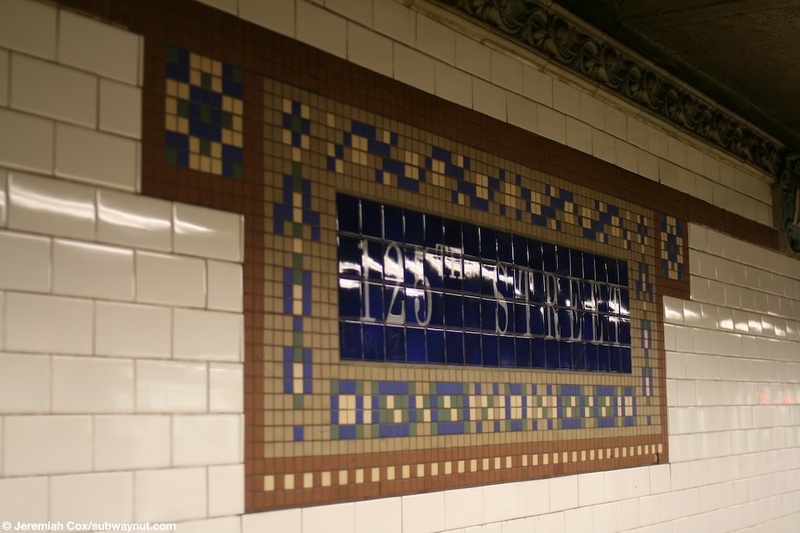 Along the trim for the rest of the station are mosaic representations of the cartouches. 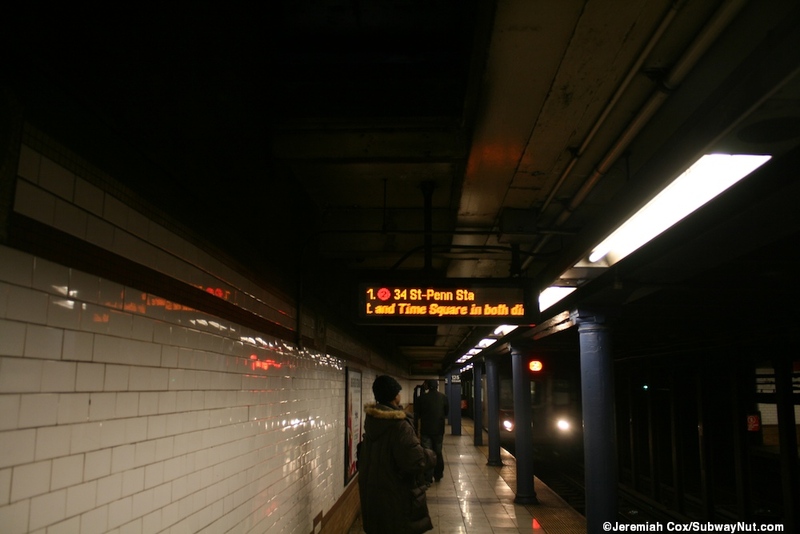 In the platform extension portion of the station the name tablets are in a modern mosaic design with a modern font. 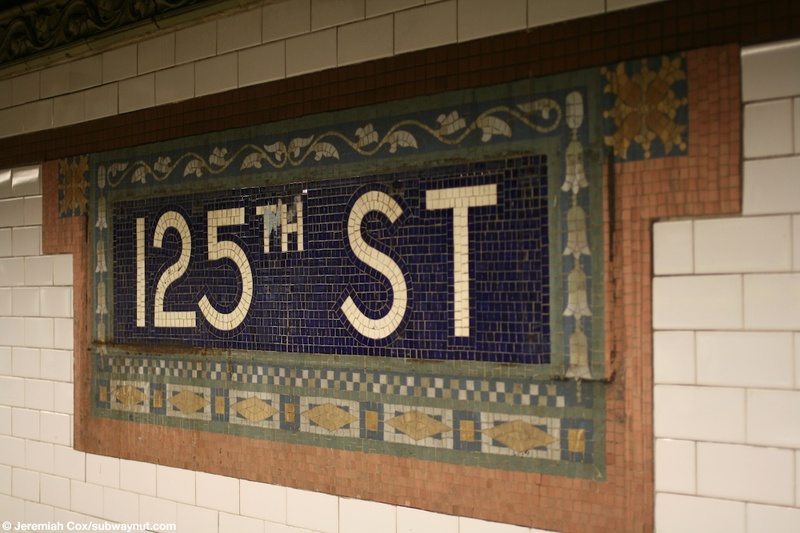 A modern trying to seem retro name tablet at 125 Street. 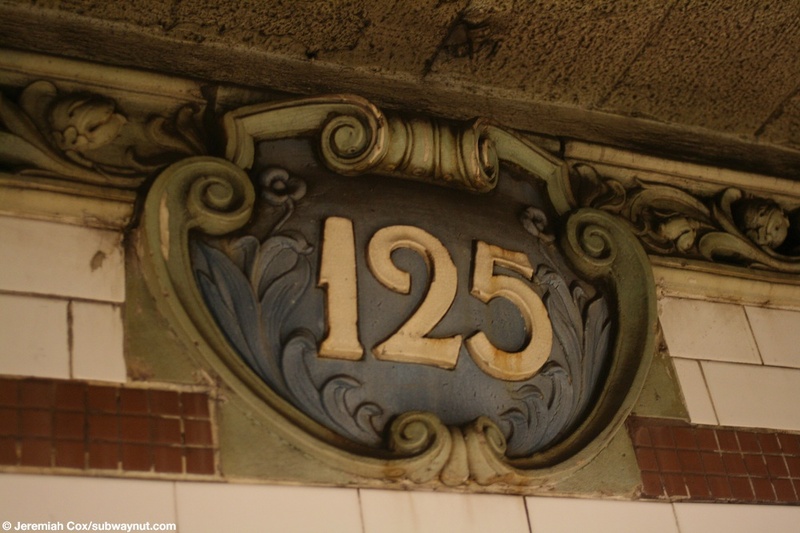 A close up of a terra cotta cartouche with 125 in it at 125 Street. 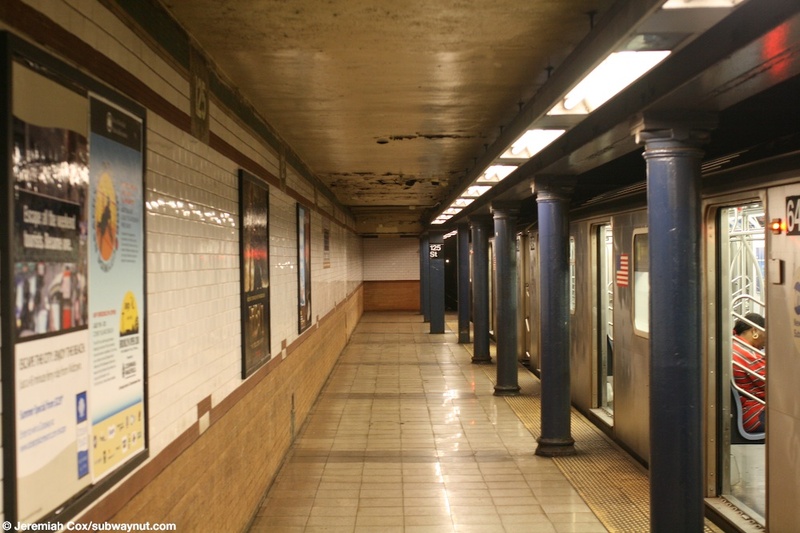 Looking down towards the end of the uptown platform at 125 Street. 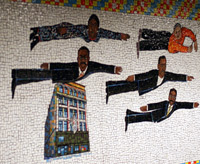 A mosaic representation of the cartouche at 125 Street along the trim in the extension portion of the platform. 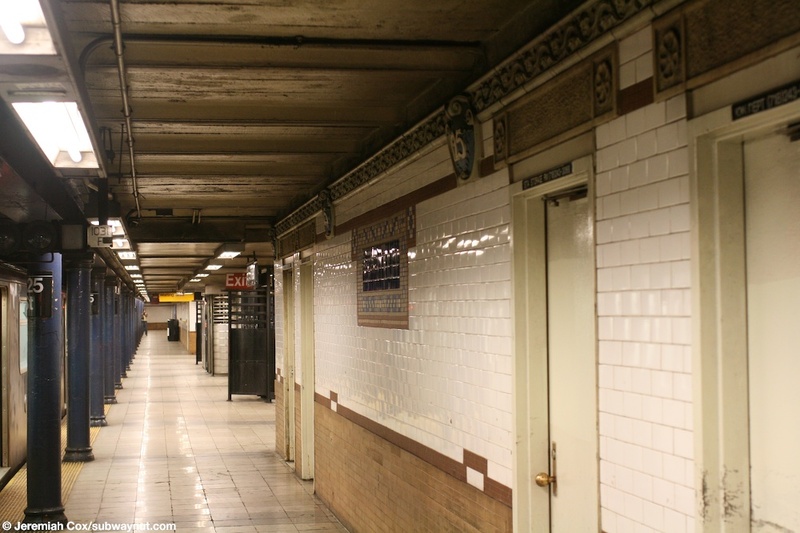 Looking down the uptown platform at 125 Street, fare control is visible in the distance four doors are visible in the foreground, each with terra cotta signs above them that have had there lettering removed when there purposes closed to the public. 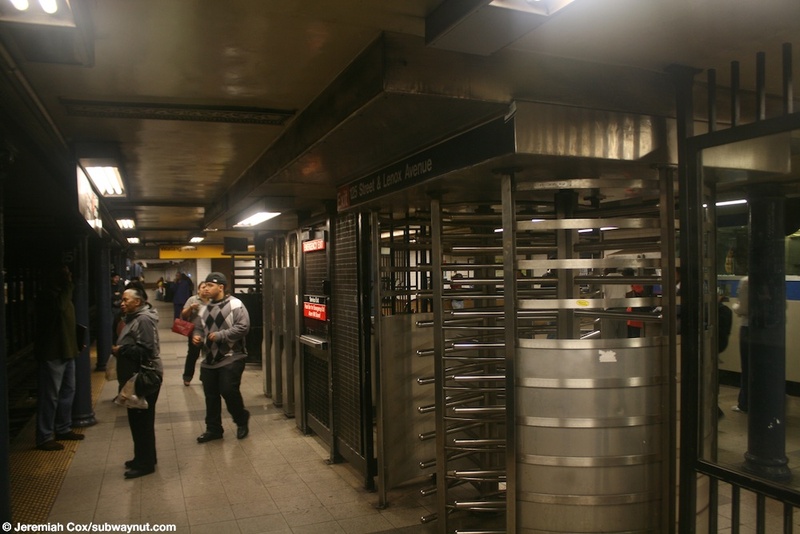 A view of the fare control area on the uptown side of 125 Street. 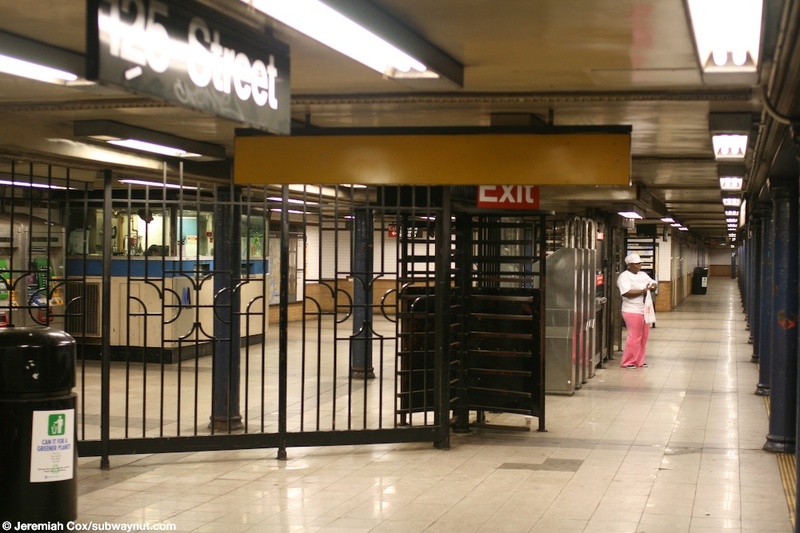 The otherside of the fare control area at 125 Street, the yellow back of the off peak waiting area sign is visible as well as the rest of the wide fare control area along the uptown platform. 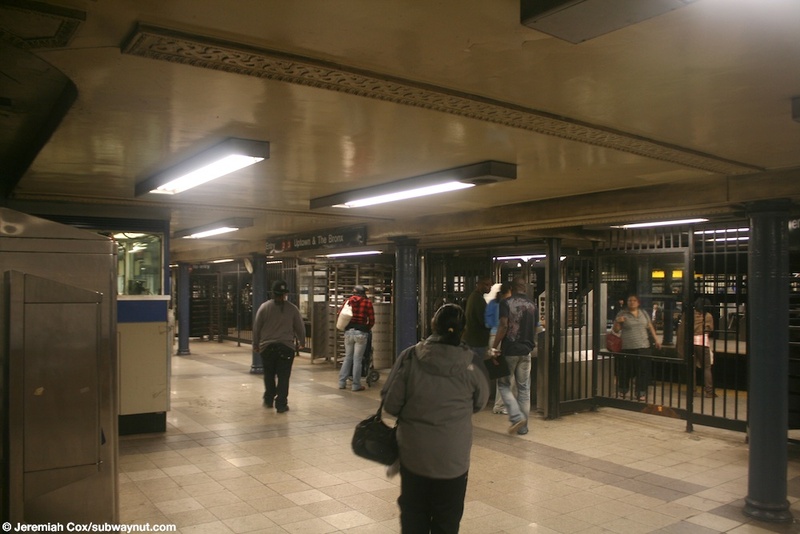 Looking down towards the northern end of the uptown platform at 125 Street, the Arts for Transit Installation in this view is visible. 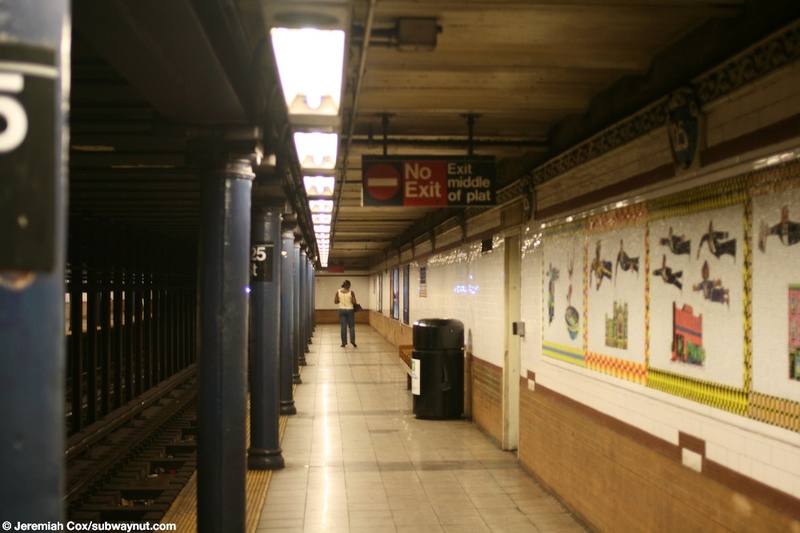 Looking down towards the end of the downtown platform at 125 Street. 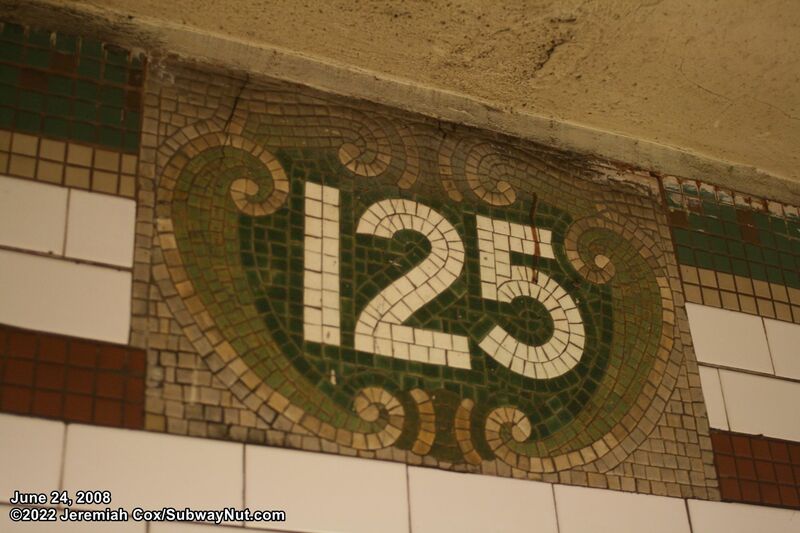 One of the few remaining restored 125 St mosaic name tablets on the downtown platform.